Binding	 Tibet, 19th c., cream silk covers, sewn on 3 cords, red and black diagram on upper cover. Provenance	 1. Sam Fogg, London. 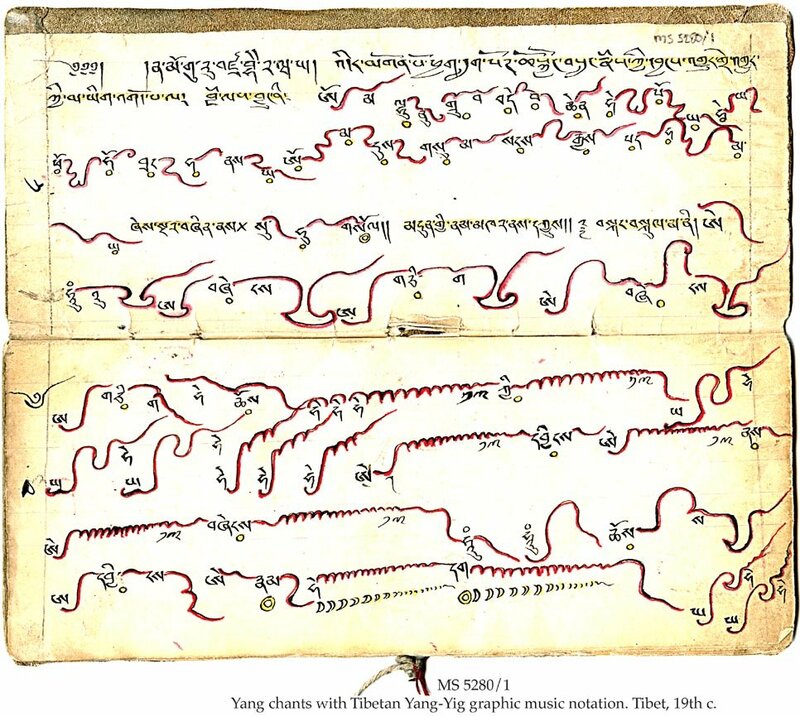 The MS belongs to the "Yang" tradition, the most highly involved and regarded chant tradition in Tibetan music, and the only one to rely on a system of notation (Yang-Yig). The chant consists of smoothly effected rises and falls in intonation, which are represented by complex curved lines. The notation also frequently contains detailed instructions concerning in what spirit the music should be sung (e.g. flowing like a river, light like bird song) and the smallest modifications to be made to the voice in the utterance of a vowel. On the whole, Yang chants are sung at an extremely low pitch and at a lingering and subtly changing pace, allowing full expression of the chanted text. 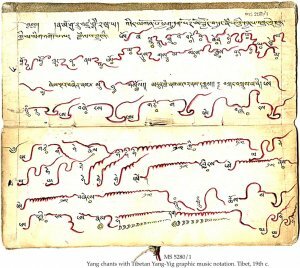 Such texts as these would have been used as a mnemonic device by the Master of Chant in a monastery in leading the monastery in the performance of a chant. The type of graphic notation of the melody line goes back to the 6th c. It does not record neither the rhythmic pattern nor duration of the notes.